Things have been popping here at the Jeep Lover's website! But before I get to that...a bit of news off the subject, and concerning yours truly. This past weekend I had the opportunity to drive a 450 h.p. 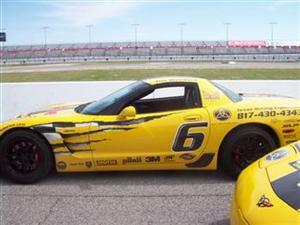 Z06 Racing Corvette around the infield road race track at the Texas Motor Speedway in Fort Worth, Texas. I know this has nothing to do with Jeeps...but I had a great time since I appreciate all kinds of great cars and trucks...old and new. It just so happens that I really do love Jeeps most of all! Anyway, I thought you might like to see a photo of the Corvette of me in the car getting ready to fly around the track for 10 quick laps. I guess I just felt the Need For Speed! 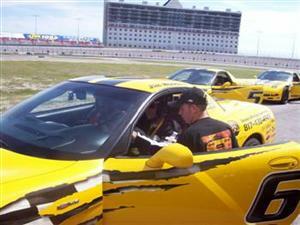 And I got a huge dose of it Saturday in the yellow #6 Corvette below. Okay...now that I got that out of my system...what's going on with the Jeep Experience here at www.4-the-love-of-jeeps.com ? Well, since the last newsletter I've been able to add a few more special video pages of Jeeps in various types of conditions, competitions and even crashes. The "Modified Jeeps" videos take a look at some Jeep work above and beyond the everyday lift kits, mud tires and add-on bumpers and body armor! How about "Drag Racing Jeeps" videos on pavement, dirt and any other imaginable surface! Drag Racing Jeep Videos...Click Here! And finally a few hairy "Jeep Crashes" in videos with thrills and spills! Fun and interesting videos to watch, if I do say so myself! Seen enough videos...then how about some really useful tips on Jeeping Safely in the Backcountry? I have personally spent some off road time in really desolate desert conditions and have first hand knowledge, not to mention respect for how unforgiving nature can be if your not fully prepared. This is a must read for basic preparation of your Jeep and yourself before attempting any extended time in the wilderness. Jeeping The Backcountry Safety Tips...Click Here! Also, you might want to follow the Back country Jeeping tips with a glimpse into my favorite desert off road destination...Big Bend National Park located in far Southwest Texas. I know that not everyone can make the long trip to the Big Bend area (it's even 500 mile from where I live...and I live in Texas), but I hope you can appreciate the beauty of the desert terrain and maybe experience some of that beauty yourself somewhere...sometime. The Big Bend National Park...Click Here! I hope to make another trip back to the Big Bend Country soon either in my 1987 Jeep MJ Comanche Pickup or the new (old) Jeep Cherokee XJ project truck I am currently looking to buy. As soon as I find the best buy on an XJ I will keep you updated. Also, I don't have any plans to sell the Comanche at this time...she's very special to me and still running great! and I hope you will. If you feel inclined I would really appreciate you sharing this newsletter and /or the website address with your friends and family (after all it is a family friendly site).